Automotive semiconductor specialist Renesas Electronics and mobility technology firm Magna have partnered on an advanced driving assistance system (ADAS) designed for assisted parking. Drivers can adjust the view of their surroundings, while object detection alerts drivers about obstacles in their path and 3D software provides drivers a 360-degree view of the vehicle’s environment. 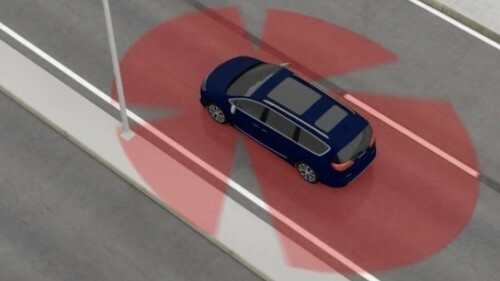 Renesas, which is headquartered in Tokyo, believes this three-dimensional perspective is an upgrade from the bird’s-eye view offered to consumers by existing parking assist systems. The company’s Autonomy platform adopts its low-power R-Car V3M system-on-chip (SoC), which is optimized for smart camera and surround-view systems. Magna’s 3D surround-view platform consists of a vehicle camera system that provides a realistic 360-degree panoramic view to assist drivers when parking or performing low-speed operations. The 3D parking platform, which includes Renesas’s SoC and microcontroller (MCU) roadmaps, is also designed to help original OEMs minimize integration time and development costs. The SoC platforms and components offered by Renesas, Magna and its competitors are needed by OEMs to detect traffic signs, lanes, pedestrians, vehicles and other obstacles in real time. With front cameras mounted next to the windshield where they are exposed to direct sunlight, low power consumption of the SoC is crucial to minimize further heat dissipation in the camera housing. The Autonomy platform, aimed at entry-level and mid-range vehicles, also lets OEMs select IP cores, such as hardware accelerators, for vision processing. The Renesas R-Car V3M SoC is equipped with a built-in image signal processor (ISP) and complies with the International Organization for Standardization (ISO) 26262 functional safety standard. The company noted “several automakers”, including one from Europe, have already expressed interest in the platform. The unnamed European OEM will be the first to integrate the 3D surround-view system into a future vehicle. “Automated driving systems require scalability to address the wide range of requirements of car consumers,” Shinichi Yoshioka, Renesas’s senior vice president and deputy general manager of the automotive unit, wrote in a statement. He added the collaboration, combining their semiconductor expertise and Magna’s automotive system acumen, would help deliver a 3D assisted parking system across vehicle classes and price ranges. Renesas already supports several automotive safety integrity levels (ASIL), a risk classification scheme defined by the ISO 26262, with its latest SoC and MCU devices. The announcement comes as countries such as the UK move forward with laws to allow drivers to use remote-control parking on local roads.